Marshall’s first love, though, was jazz, and a new book testifies to his more quietly intimate approach to photographing musical titans such as John Coltrane, Duke Ellington, Miles Davis and Nina Simone. Simply titled Jazz Festival, it is not just a collection of great, mostly unseen fly-on-the-wall portraits, but a document of what the veteran jazz writer Nat Hentoff, describes as “one of the most important periods in the cultural history of the United States”. From 1960 to 1966, Marshall photographed the performers and the audiences at the Monterey and Newport jazz and folk festivals, the precursors of the huge hippy gatherings of the late 60s – Woodstock, Isle of Wight, Glastonbury. His images attest to the surprisingly intimate and formal nature of these early events: everyone is dressed smartly in the preppie-meets-boho style of the time and the audience sits attentive in rows of seats as if attending a classical recital. 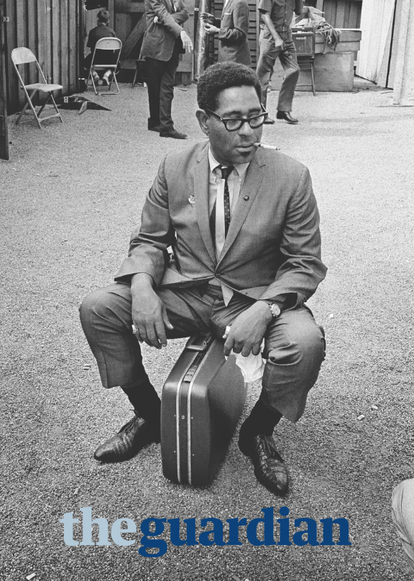 In 1966, Marshall also trained his camera on Jefferson Airplane and the Paul Butterfield Blues Band, who were among the first wave of rock groups to play at the Monterey jazz festival. Change was in the air and the following year Marshall would capture Hendrix setting light to his guitar at the Monterey pop festival, a moment that, in retrospect, announced the start of the second wave of – bigger, brasher, louder – music festivals in the late 1960s. Marshall rode that wave too, chronicling the three-day Woodstock festival in 1969 – which he later described as “organised chaos” – and making his name as one of the great rock photographers of the time, despite gaining a reputation for excess that matched that of even his most dissolute subjects. Jazz Festival should go some way to re-establishing Marshall’s reputation as a photographer who, despite his tough image, made some of the most tenderly observed, quietly powerful studies of a now long gone, but still resonant, cultural moment when jazz was both a unifying force for change and the soundtrack to a turbulent nation whose discontents reverberate to this day.